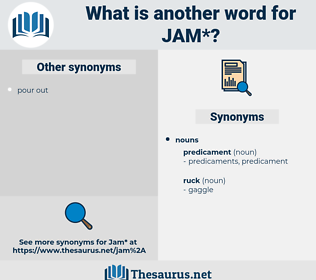 What is another word for jam? storage and use as a condiment confection. 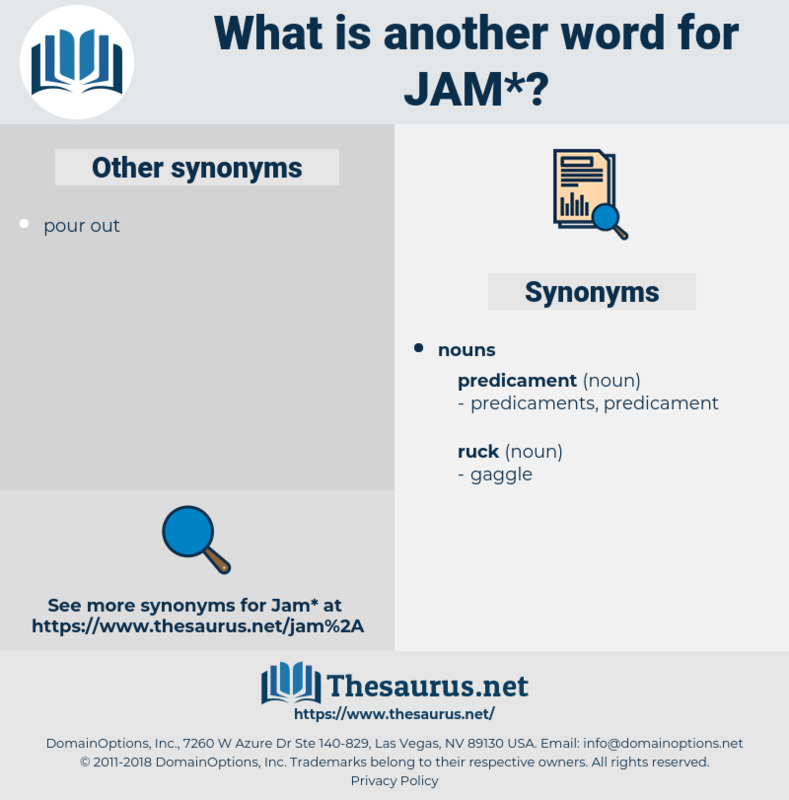 congestion, jelly, logjam, suffocation, blockage. good fortune, blessing, ease, benefit, peace, advantage, solution, contentment, success, pleasure, boon. continue, surrender, uncompress, let go, free, loosen, allow, refuse, yield, unblock, untie, release, pull, clear, open, help, unfasten. I remember when he turned his cup at Aberbrothick, where we drank tea, he muttered, Claudite jam rivos, pueri. Lanstron shook a small hand which must have lately been on intimate terms with sugar or jam. Johnny, jazzman, jean, John Wayne, jamb, june 3, JEM, jejunum, jackson, jasmine, jemmy, jacksonian, jena, Joachim, juneau, june 29, jawan, june, jenny, jug wine, jewison, John, juno, jinnee, june 24, jinni, jain, june 21, jacksonia, june 14, jacquinia, join, 6 June 1944, Jesse Jackson, John Wain, jason, jejune, jimmy, jasminum, Jinnah, jonah, jan, jessamine, june 23.
force, push, crowd together, crowd.